With input from local indigenous community members, this garden is being installed to honor the 12,000 years of Native American cultural history at the head of the San Antonio River. The 80 foot in diameter limestone structure will be filled with native medicinal and pollinating plants to educate the public on ethnobotany and the importance of providing sustenance for pollinators like the migratory Monarch butterfly. The Headwaters Circle of the Springs garden will be a place of reflection open to all people in San Antonio to learn, commune with nature, and find a sense of community while honoring the long history of people here before colonization. The Headwaters Circle of the Springs garden will be located on our Upper Field, about 600 feet away from the current Sanctuary Trailhead. Our garden is inspired by the White Shaman Panel, rock art painted by Coahuiltecan peoples over 4,000 years ago. The panel depicts the four fountain springs of Texas: Comal, San Marcos, Barton, and our own Blue Hole. Some scholars see the panel as a celestial and cosmological map, one that may have guided people long ago in their pilgrimages to the fountain springs. 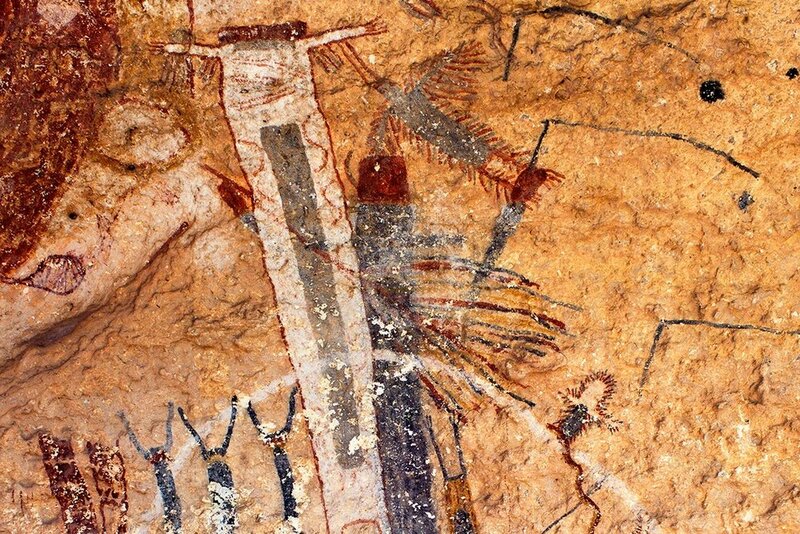 Based on archaeological, geological, and astronomical analysis, the rock art depicts 16 springs in Texas as a whole. Our garden will have 16 spokes radiating from a central meeting place, one pointing towards the Blue Hole so that the sunrise will be visible over the spoke on the winter solstice. Volunteers will help to lay down limestone edging and walkways, spread dirt, and plant native medicinal and pollinating plants. Beneath the limestone, volunteers (guided by indigenous community members) will lay down loose tobacco to honor ancestral San Antonians. Volunteers under 14 must be accompanied by an adult. Wear close-toed shoes and outdoor clothing. Bring a reusable bottle and sunscreen. Snacks, gloves, and equipment provided.